Area Description: We made a poor choice of trails for conditions. This trail is narrow, and goes along a steep south facing slope. 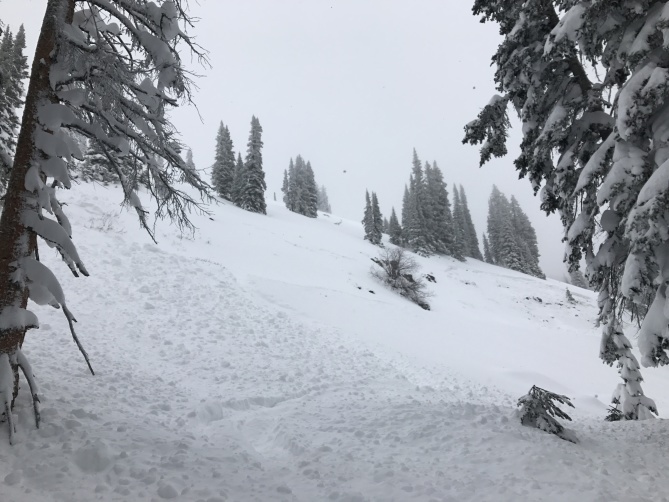 Weather Description: Heavy Snow, 24" fresh on top of fresh. Avalanche Description: 8 riders in our group, riding along 311, where 311 turns into a steep hill that the trail crosses, a rider triggered avalanche occurred. 2 rear riders had paused to make sure front riders made it across the 'danger zone' just as the entire hill slid. 4' slab at deepest point. 2 riders buried 4' deep, pinned on trees. 1 rider remained on top of slide. Both buried riders were breathing, with searchers only having radio confirmation of 1, breathing, but pinned under sled. Probe search and extraction took 10-14 minutes, both buried riders were ok. Both riders had Avy packs, one deployed, one did not grasp handle, which appeared pretty high on shoulder. Both lives were saved by people who had taken Avalanche courses, taken control of the situation, and did an efficient and effective search and rescue.